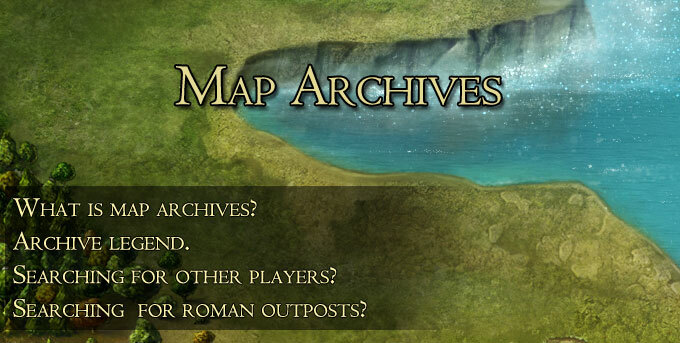 Map archives allow you to search for other players and castles through details such as name, xp, mp and distance (range) from you castle. You can access the Archive menu by clicking on the eye glass icon while on the global map screen. The legend can be viewed by pointing at the icon on the right side of the archives menu. You don`t need to fill in all type boxes to get the desired results. You can simply type in the name of a player and check the location of his castles. Alternatively you can look for rivals based on their military or experince points. To look for deserters tick the checkbox and hit the search button. 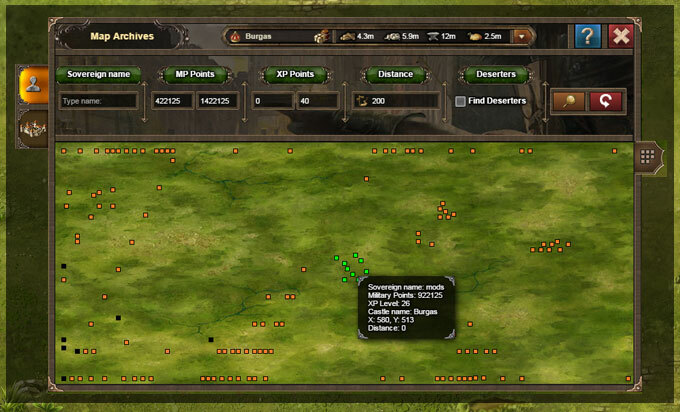 Finally you can seach the area around your selected castle and have an idea of who is lurking around. You can look for roman outposts around you based on the distance/ radius from your castles.